Herm Sprenger’s Stainless Steel Ultra Plus Training Collar with black finish. The addition of the center plate connector allows the middle link to be configured symmetrically, so they tighten in the same direction. 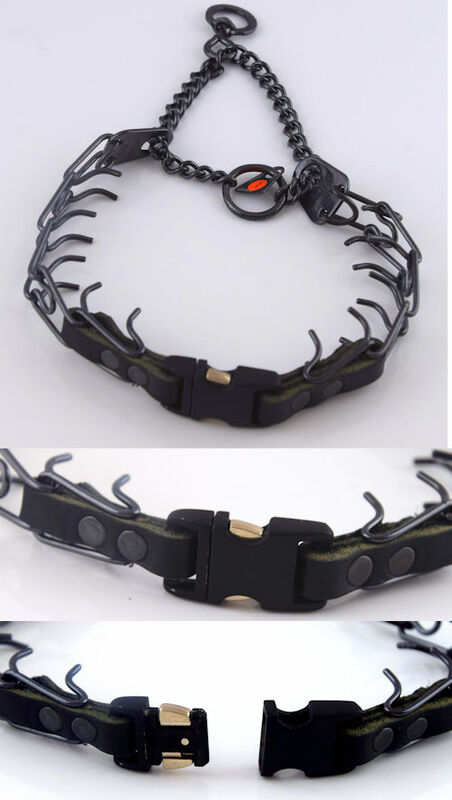 This design improves the effectivenesNs of the training collar. The black is not painted, it is a chemical process that turns the stainless steel black. These collars are 100% rust proof. Herm Sprenger’s innovative design replaces the traditional wire eye link with a solid fastener plate (Ultra Plus) that provides a more secure connection. Finest quality precision crafted. Made in Germany. Dogs should never be left alone with prong collars. When properly fitted and used correctly, prong collars are very effective and safe training tools. The collar should be worn snug on the neck and should be fit just under the jaw, right behind the ears. Sizing: When measuring your dog , measure around the neck behind the ears.